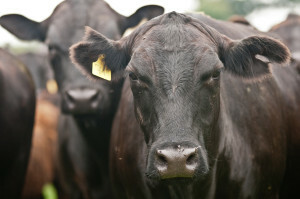 Rearing beef is one of the most environmentally damaging activities in agriculture. As global demand for beef rises with increasing affluence, the environment will suffer. Beef consumption is a good example of an activity that is unsustainable when pursued by 7 billion people. Raising cows from conception to consumption uses a tremendous amount of resources. Pound-for-pound, beef uses 28 times more land, 11 times more irrigation water, and 6 times more fertilizer than the average of other livestock categories, such as poultry, pork, eggs, and dairy. Most of these resources are used to grow cattle feed. Some 1,800 gallons of water are needed to produce a one-pound steak. In the U.S., beef production accounts for about 45% of phosphate fertilizers, a resource with limited global reserves. These are average values: feedlot beef has a greater impact than pasture-raised beef, but both categories have considerably more impact than the provision of other forms of protein. With global food demand expected to double by 2050, we will soon be growing more crops for livestock than for ourselves. This land conversion will leave a lot less habitat for nature. In terms of global warming, the decision whether or not to eat beef has an environmental impact equivalent to a decision to buy a gas-guzzling SUV versus a fuel-efficient car. If you are serious about reducing your footprint on nature, less beef should be what’s for dinner. Photo, posted July 12, 2013, courtesy of the U.S. Department of Agriculture via Flickr.